'Meet-a-Scientist' was a segment of the LENScience Face-to-Face programmes. These programmes provided opportunities for 11-18 year old school students to engage in learning exploring the work of scientists within a university environment. The programmes linked to the LENScience learning modules used by schools throughout New Zealand. The 'Meet-a-Scientist' was active from 2006 - 2016. 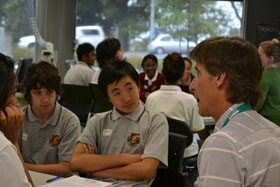 Professor Wayne Cutfield chats with students as part of the Meet a Scientist segment of the LENScience Face to Face programme. 'Meet-a-Scientist' was one segment within the Face-to-Face Programmes. It offered an opportunity for students to participate in conversations with people who are engaged in science within their work. This included scientists, clinicians, technicians, research assistants, research nurses, science writers, science communication specialists and all postgraduate students. During 2014 alone, the programme was supported by 158 participants from within the science community. The programme reaches 8000 school students annually. For more than 90% of visiting students, this is the first time they have met a person who works within the science community. This experience has a significant positive impact on perceptions of science and scientists. The Face-to-Face Programmes support improved engagement in science on return to the school-setting. These programmes have heightened significance for students from communities not well represented within the university. The scientist would meet with two groups of 8-10 students and spend 15 minutes with each group. They would take 5 minutes to tell the students something about their work and journey into science. Then allow the students time to talk to them, ask questions, and time for the scientist to ask them questions. The scientist was not allowed to use PowerPoint, however they were welcome to bring a prop. Professional teachers from LENScience and from the visiting school supported the scientist. 'Meet-a-Scientist' is not active at the moment.